We have just returned from our first overnight session targeting catfish at Badshot Lea and although cold, the cats were as obliging as always with cats to 27lb 10oz. If you fancy targeting these and need some guidance then why not book up an overnight session with myself and fellow Nash angler Chris Petter. We will provide all tackle, if needed, as well as enough pellets to see you through the night, even if it’s a hectic one. These overnight sessions are limited so if you want more information then just email me duncancharman@me.com and we will arrange a night under the stars in the quest to catch you a personal best. To get a monthly round-up of what I have been up to then visit my website www.duncancharman.co.uk. Alternatively you can call me on 07928 617006. It’s been another busy month with thirteen sessions on the bank totalling 105 hours split between guiding (6), Features (3) and personal sessions (4). The first campaign of the year targeting golden orfe was a glowing success and the whole report can be read in the separate write up coming very soon, however it did produce me a personal best of 6lb 5oz plus a personal best of 6lb 2oz to my mate Chris. The other campaign targeting silver bream didn’t get off the ground, mainly due to the limited time on my hands and spending what I did have at Newdigate. Once again the time behind the scenes just organising kit, travelling to venues, writing up reports as well as the features that aren’t even mentioned has taken up loads of time, yet it’s good to be busy. It was good to get out at the end of the month and target the cats at Badshot Lea with three good fish to 27lb 10oz landed between the two of us. These sessions are very popular with anglers requiring guiding so if you are interested best get in touch, email duncancharman@me.com soon as these overnight sessions are limited. So with one campaign out of the way it’s onto our next species which will be crucian’s at Enton. I’m going to leave the first week relatively alone as I know the venue will be packed but am looking forward to getting amongst them at a time of year I usually avoid, yet sometimes you have to follow the crowds, however if it is just silly then I do have plan b. Below is a day to day rundown of events, hope you enjoy and look forward to seeing you bankside. 1/4/15 – At last a lay-in as I was to meet an angler at Old Bury Hill Fisheries mid morning to create a ‘Venue Expert’ article for Anglers Mail. Back at home, and after downloading the images, I managed to get the tackle ready for a days fishing on Thursday as time on the bank over Easter just not going to happen. 2/4/15 – Big Fish Session. 5/4/15 – Unable to get an early start and knowing the banks would be slightly busier than normal I decided to spend most of the day writing up the ‘Venue Expert’ article for the Mail as this would free my time up next week. 7/4/15 – I can’t wait to get back out. I’ve spent the last few days mostly tidying up the tackle shed and garden and although I feel good for doing so it only takes a couple of days away from fishing and I start getting withdrawl symptoms! Tomorrow I’m at long last getting out and although I’m not fishing myself as I have a one of my regular customers just being on the bank and going through the motions will do. The great thing at the moment is I’m not swaying between species and letting my customers know what I’m up to and what’s coming out usually means they take my advise and agree to come to where I’m fishing which simply means the rods are already rigged up and ready to go. All that needs doing is organising bait which I did today and was somewhat dissatisfied with what happened. Now anyone that reads my blog will know that in the past I’ve been sold some crap, namely three pints of maggots for the price of two due to them not being brilliant, then getting to the venue to find them dead along with the often, bunch of jelly like lobworms. I now check what’s served up and if not satisfied reject them; well I am the customer and have the right to do so! Well today I bought a pint of maggots, however on leaving the shop I felt that the pint seemed somewhat short so did a quick check by pouring them into a pint glass when I got home, and guess what I was right, as they, after having maize added were around a inch below the rim! Yes, by simply looking at what’s served we all can see the quality of the bait, yet how many of us check if we’ve been served the right amount, very few I expect! 8/4/15 – Today was spent with one of my regulars, Ron Jackson fishing a small Surrey day ticket venue. Unfortunately the weather was warm and with hardly any wind on the water it soon became apparent that the tench weren’t on the feed, however persistence paid off and Ron managed a couple of tench of around 4lb. I was planning to return the following day with my father but with the weather still well above the monthly average decided to head down to Mill Farm Fishery instead. 9/4/15 – Arriving later than wished we found the lakes, as expected rammed and dropped into a swim far from my first choice on the specimen lake. Two hours in and with just a couple of fish to our rods we moved to the far bank in hope of finding some fish and although the fishing was better it was still tough with the best fish being a roach of around 1lb 8oz. This complex has just opened and always takes a week or so to settle down so wasn’t that surprised it was so tough. 11/4/15 – Big fish session. Summer must be coming as the first swifts/swallows/martins (not a twitcher) are in the air. 12/4/15 – Up early once again and on the road to pick up my mate Tom who helps me out shooting video. Today we had four venues to visit by 2pm to complete the Where to Fish features for Anglers Mail. As a thank you I’m taking young Tom to Marsh Farm on Wednesday to see if we can up his personal best tench and crucian. 13/4/15 – Will I get it all done today? With a busy week ahead I needed to get stuck into things today, however a migraine mid afternoon didn’t help matters. The morning was spent getting the bream rods ready for a days guiding on Tuesday then it was time to tap away on the computer and complete a feature for Coarse Angling Today. If you don’t get this magazine you are missing out as it does provide the everyday angler with loads of tactical advice. Luckily the sun came out midday so I was able to take a load of images for the feature along with once again sitting down in front of the computer to start getting things sorted for a Bt Sports feature on Thursday. 14/4/15 – With a couple of new customers looking at catching a few bream we headed to FAS Badshot Lea Big Pond, however with the hottest day forecasted things weren’t exactly on our side. Fortunately their was a steady south west breeze creating a ripple so I knew that fish would be caught but how many? Setting up in pegs 55 and 56 it was an all-out feeder attack with the helicopter rig having to prove its worth in such conditions and it wasn’t long before the alarms sounded. A steady flow of bream up to around 6lb, mostly to Craig graced their nets before they disappeared but luckily the tench took over as well as a double figured carp which gave Chris a good run around. In total they shared a catch of nine tench to 6lb 12oz, one carp and seven bream, not bad when the temperatures reached a sticky 24 degrees! 15/4/15 – Having young Tom help me out over the weekend with a couple of short videos I promised him a days fishing. Our first choice was Harris Lake on the GAS portfolio however with temperatures soaring to 25.5 degrees and knowing the venue offers little cover, as well as knowing Badshot Lea was fishing well we headed their. I arrived before Tom and my dad and had five bream in five casts so things looked good. Tom arrived and soon found himself attached to a double figured carp which came on the rod cast short, really in the hope of a few tench. A steady flow of bream then followed, the best 5lb 10oz with dad taking a couple as well as a nice tench. Things then slowed right up around 2pm so we decided to call it a day but not before Tom landed one more fish, a personal best roach/bream hybrid of 3lb 10oz. With Tom predominantly a river angler it was a big learning curve, especially with casts around fifty yards needed but come the end of the day he had almost mastered the art and went home a happy man. Having finished slightly early I managed to sort out the kit for the following day as well as write a few words for Anglers Mail which was a bonus. 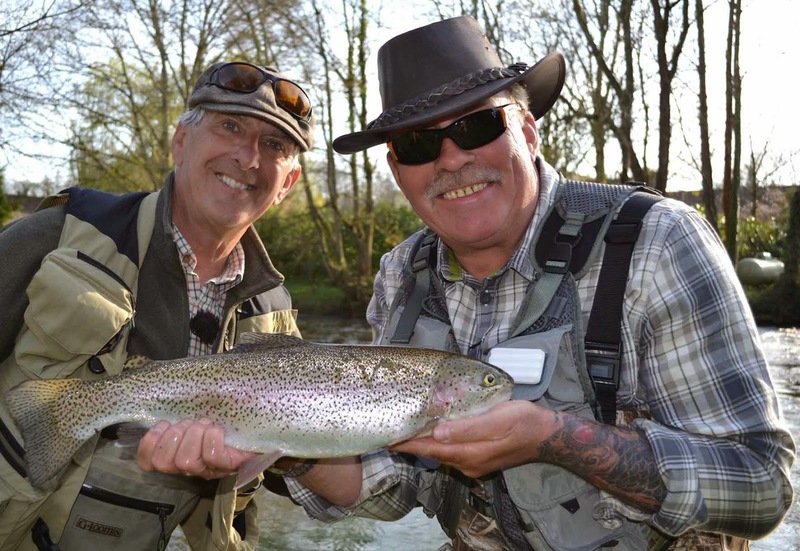 16/4/15 – Today was booked with Paul from Fishing TV. Fortunately the temperature had dropped slightly and having some cloud cover helped however the wind had swung to the east, not good. I cant say to much as you will have to keep your eye on www.onlinefishing.tv to see the whole programme but in short the day couldn’t have gone better with tench after tench falling to both float and feeder tactic as well as a bonus fish! The action was so hectic that Paul even got a few fish under his belt and when we came to the afternoon when we needed to do some short format hints and tips actually had to wind the rods in! 17/4/15 – Having booked so many things in and having so many early mornings today was all about catching up on a few things, taking it easy and getting stuck into sorting out the wedding images from last week as well as sorting the kit for a tench guiding day on Saturday. Not exactly a lazy day then! 18/4/15 – Mark Gratham fancied a day catching a few tench so we headed to Newdigate on a chilly morning. The N/E wind made float fishing almost impossible so we retired to using feeder tactics which resulted in eight cracking fish including three orfe. Chris tried his luck for the carp with just one tench obliging along with an aborted take. The frogs and their mating chorus made us all chuckle and the first signs of summer approaching were evident with a cuckoo calling, swifts in the air and ducks with ducklings. It’s a great time to be out fishing and with everything greening up and the fish beginning to feed making decisions on where to go and what to do endless. 22/4/15 – After two days off manipulating wedding images it was good to be back out fishing. This time it was a half days introduction for regular Adrian to Godalming’s Angling Societies Broadwater. Arriving once again to a frost, the third in as many mornings, I decided to fish along the rugby bank. The reason being that their was a chilling easterly blowing and my educated guess was that the fish would be off the back of this. Wrong as after two hours and with just one carp, a 16lber hooked up the arse, I was sitting thinking I we were in the wrong place. Other anglers along the same bank were also struggling and with no angler brave enough to fish with the wind in their faces it was time for a professional call, ‘lets move’. Twenty seconds after casting out the bobbin twitched and I smiled as at this time of year fish act in strange ways and can have you guessing to their whereabouts. I cant give my secrets away but less than three hours later and with a further fourteen carp landed, including a brace of seventeen’s landed at the same time, we were saying our farewells with an estimated 180lb of carp landed. 23/4/15 – If their was one massive tip I could share at this time of year it would be, if your sitting catching very little, then you need to move as fish are waking up, needing to feed, but are still shoaled up. Yesterday was a massive lesson for Adrian and today the same lesson was learnt by Ian, my next customer as after two hours fishing a noted swim at Badshot Lea Big Pond and with just six bream and a carp to show for our efforts in the first two hours, it was time to move again. Now many would say, a carp and six bream, Id be happy with that in a day, yet having grown up on this lake and knowing it at this time of year, I knew the swim should have been doing more. Two minutes in a new swim and the bobbin danced and a bream graced Ian’s net. Five hours later a further two dozen bream had slipped up along with a couple of tench, the best 6lb 3oz. The rewarding part taken from the session was that we fished two contrasting methods, one was the heli-rig the other a scaled down bolt rig and they performed equally as well. Ian mentioned during the session that he hadn’t had a day off from work for a while and was in need of some chill time and that at the end of the day felt it was exactly what he needed. Another rewarding part was that my dad whose well into his eighties had fished a few days before, taking 28 bream on my alternative method. He’s the man the taught me everything and I’m still learning today! 24/4/15 – Luckily the weather forecast earlier in the week of rain for Friday held off as today would be spent at Newdigate Fishery with my father, girlfriend’s dad Mick and his friend John. After a jolly through the countryside John and Mick finally arrived to find myself and Dad already set up. Placing them on the far bank with us sat with our backs to the lodge we knew straight away from the lack of fish moving that today’s wasn’t going to be easy. I’ve learnt a couple of things at this lake and this is it never fishes well if its foggy and this morning just seeing the far side of the lake was impossible, the other thing is when the frogs are quiet so is the fishing! Having caught most of the orfe and with the tench only reaching 6lb I thought it would be a challenge to catch a carp so with just one rod I tried my best, moving around numerous times only to land two tench. Mick and Dad both caught steadily with six tench a piece and John managed just one fish, an orfe around 4lb so it was a great day out even if the fishing was slow. 27/4/15 – Awaiting a parcel collection to go the Anglers Mail, the best part of the day was spent catching up on things such as emails, catch reports etc as well as writing up a CAT Nash Think Tank for Paul Garner. I did manage to get over to my parents and take mum out for 9 holes of golf, not a lot to write home about, apart from I was around 3ft from a hole in one! Once back home it was time to get the tackle ready for a few hours at Mill Farm Fishery to complete an article for Anglers Mail the following day. 28/4/15 – Arriving at Mill Farm Fishery at 7.30am we were fortunate to secure the big double commanding the two islands. A ground frost and really chilly westerly made things quite uncomfortable however the first carp came twenty seconds after casting out and although at times we had to change bait and cast regularly the fish kept coming with the biggest of twenty carp going 15lb 10oz and plenty of silver bream yet no monsters. 29/4/15 – The day started by completing the Venue Expert feature for Anglers Mail before getting the kit ready for a catfish session over night. Arriving at 6pm we found Badshot Lea fairly empty and set up in our favoured swim giving us access to lots of open water. Filling the bait boat and getting all four rods out by 8pm laid the traps and come 9pm I found myself into my first cat, one that weighed a pleasing 27lb 10oz. Chris then had two quick cats of 22lb 6oz and 19lb 14oz up till midnight. Setting all four rods once more at midnight we expected more to follow but it wasn’t to be and found ourselves packing away come 5.30am as well as scrapping the ice of the car windows. 30/4/15 – After a couple of hours kip the day was spent drying out the overnight kit, cleaning it up as well as getting some dates in the diary with local venue for Anglers Mail features and sending them a monthly blog, this time on targeting tench. Rae Borras takes Ian Chillcott for a days trout fishing on the famous River Test in Hampshire. Rae gives Chilly some pointers on the finer techniques by using the rivers current to impart movement and thus entice the waiting trout into taking the fly. Adam Penning talks about short session success for bigger carp whilst fishing at The Quarry in Essex. Using krill flavoured fishmeal boilies that have been glugged in spicey fish and hemp oil Adam puts his skills to the test and lands a classic carp. 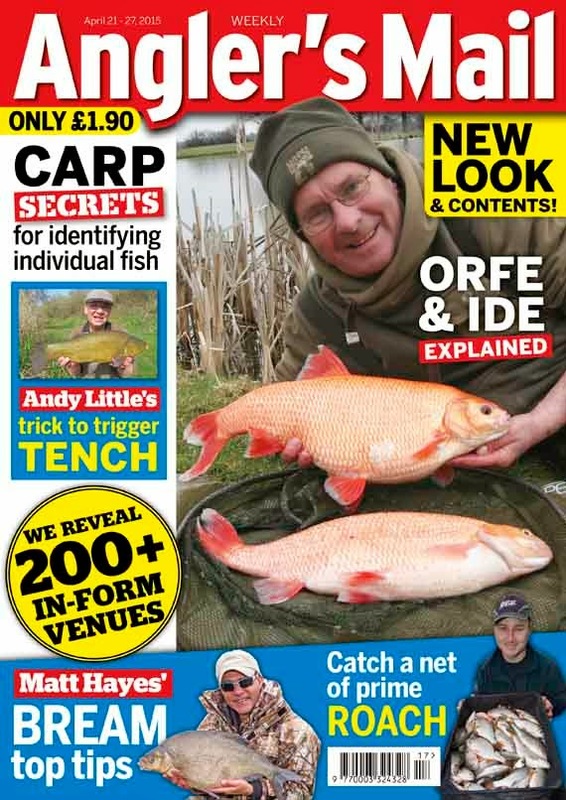 Duncan Charman features in the ‘Did You Know’ with some early season tench fishing. Barbel are on the cards as Des Taylor enjoys an early morning start on a misty River Severn. Des doesn’t disappoint as they come on the feed and he lands a lovely conditioned fish. THIS week’s Angler’s Mail magazine reveals how a match star has bounced back from the dead, and how 640,000 fish have been saved. Must-read stories! Also this week, the all-new Mail is the place to read about a 7 lb secret perch venue that has delivered again! The MEGA Where To Fish This Week section is a massive regional guide, and now has over 200 venues. It’s the No.1! Steve Collett on real pleasure fishing!